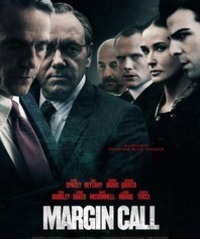 In some ways Margin Call feels like the news, and in some ways it feels like history. Written and directed by J. C. Chandor, it is an astonishingly assured debut feature, offering something of an insider’s view of the origins of the financial crisis that leads way back to the Bush presidency (hence the history), but which continues to play out in the headlines today. However, one of the unfortunates, Eric Dale, played with hangdog melancholy by Stanley Tucci, hands his young protégé, Peter Sullivan (Zachary Quinto), a memory stick which ought to be ticking loudly. Whilst his colleagues celebrate in a downtown bar, Sullivan (they all share these anonymous names that are almost as forgettable as the film’s title itself: is it Margin Call or Call Margin?) runs Eric Dale’s computer model and discovers a disaster waiting to happen. A minor fluctuation in the markets would leave the company massively exposed - indeed, would effectively bring the company down. The remainder of the film is essentially a financial procedural, and it is a testament to the skill of the cast and bravery of the filmmakers that this begins to feel not only like important drama but also something of a thriller, and nary a gun in sight. Bit by bit the news is kicked upstairs, and each step of the way it seems to get grimmer, the potential fallout more apocalyptic. The panic spreads and the responses almost immediately begin to put the company above every over consideration. Careers will be destroyed; other companies will go bankrupt; the economy of the nation will be severely damaged. But the company, in the end, must be protected. The CEO, John Tuld (played with sulphurous charm by Jeremy Irons in his best role for over a decade), arrives in the night to take over the controls despite priding himself on not knowing the true nature of the complicated financial products he offers. Read our Alternate Take on the film's relationship to other movies tackling the financial crisis here. This review was published on January 24, 2012.